Korn Drums Play Along Book / CD – Learn some of the popular Korn songs more quickly and easily with this drums play along book! 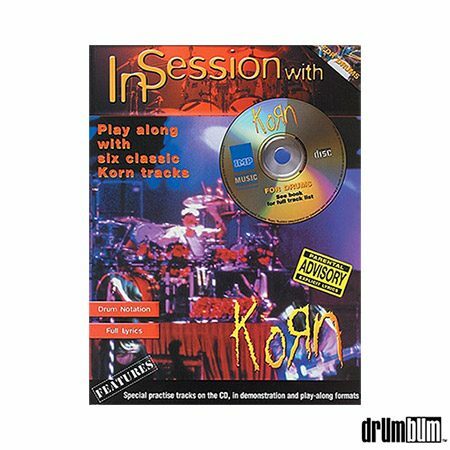 The InSession with Korn book brings you six classic Korn tracks: Freak on a Leash; Shoots and Ladders; Justin; Got the Life; A.D.I.D.A.S. ; and Pretty. Just follow the drum notation, listen to the CD to hear how the drums should sound, then play along using the separate backing tracks. The lyrics are also included for quick reference (Parental Advisory – Explicit Lyrics). The audio CD is playable on any CD player features special practice tracks on the CD, in demonstration and play-along formats. Softcover Book approx. 9″ x 12″ and 56 pages.